It is possible to Make Money with Affiliate Marketing without a blog, I have explained the thesis here. 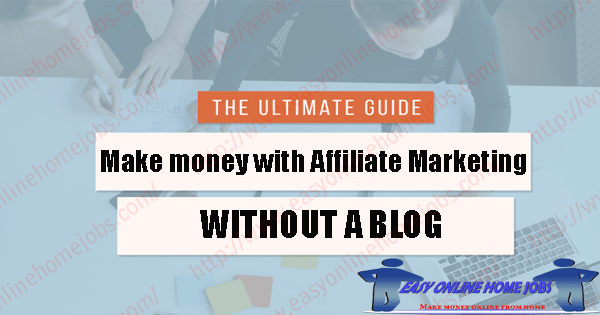 Hello my dear visitors, Today I am going to share you the information about, “Make Money with Affiliate Marketing Business without a Blog”. I had to get to know this question from one of my blog visitor, so this had given me an opportunity to write this article. When you think of starting an Affiliate Business, what most people would say is “Start a Blog” and choose the right product to promote. Write articles about the product and publish on your blog, promote it and convert visitors into customers. Yes, Affiliate Marketing Business was one of the best ways for generating passive income through the Internet. The world of the internet provides many opportunities for us to make money online. There are so many ways to make extra money and one of the best ways was Affiliate Marketing being used by many people worldwide. It is one of the topmost ways to earn a huge income while sitting at home by working online without investing a single penny. Every people want to make some extra money from their home. For this instinct, online jobs are the only way to satisfy this Instinct. OK, first let me start with the introductory class. 1.) What is Affiliate marketing? It is a performance-based business model, where an affiliate or an individual may earn a commission based on the total sales made on behalf of a merchant. Yes, you can make money by selling other’s product or services. You basically, recommend a product or services to your readers, viewers or blog audiences and upon any successful sales, you will get a commission. It is one of the widespread and lucrative online businesses for people to make money online. Promoting someone else’s product and getting a commission for every sale you make is simply called Affiliate marketing. Affiliate business gives you a monthly income of $1000 – $50000 and Yes, it is possible – No Magic or no Gimmicks. 2.) How to Start Affiliate Business? Bank account and/or Payment Processor accounts. Everyone, who has the ability to market products can start this business. It does not require any special skills or physical store or go down to maintain the inventory. All you need is a virtual store called as Blog or a website. 3.) Who Can Make Money with Affiliate Marketing? A lot of bloggers use this program to supplement their additional income through blogging. Some bloggers use affiliate marketing as their primary business and making more than $25000 every month. This can not be achieved over-night and it takes a lot of time, effort and dedication in their work. Because you are not just selling products or services, but you need to maintain loyalty and trust among your audiences so they can become your long-term customers. So, here comes the actual question. Was a Blog necessary for Affiliate Marketing? Is it mandatory to have our own blog? Does this mean that If you don’t, you can’t get a slice of this marketing pie? Absolutely not! In fact, there are so many other ways to make money online as Affiliate Marketer and you know what? We are going to discuss this in this article. Yes, as I told, here are the different ways to make money with Affiliate Marketing. If you have the true interest to make money online, we can easily make it worth. Social Media has one of the biggest influence on all online market. Almost all people have at least one media account on Facebook, Twitter, Google Plus, Stumble Upon, Tumblr etc. Social Media is not only to socialize yourself but when you use it professionally, of course, you can make a decent income through it. Yes, normally on social sites, you can create a wide range of friends network, and might you have joined in different groups also. Here is the potential that, you can place your affiliate links within your timeline posts, and/or group posts and publish it. This will be get notified to all people in your network and may lead to a chance of getting conversions. But, this is not as easy as walking in the park, because you need a group of very active people on your social sites and also the product you promote should be within their search or taste. If you don’t have any social profiles, it’s not a tough one. You can easily create an account. I am not going to flush this information in this post because I don’t want to mess up things. i.) Create a Social page on any subject that you interest in. But, I would suggest you choose this profitable niches – health, relationship, money. ii.) Start building a strong network by sharing interesting information and popularize your network. iii.) Once you have a decent volume of people in your network, register with Amazon Affiliate Program, to start promoting products. iv.) Remember, do not scam anyone, do not annoy users, do not flood with ds. v.) Be professional, Be friendly, Be social. Create a social profile on Facebook, Twitter, Google Plus. Build a network of people with a similar mindset. Engage with interesting, useful, thoughtful posts and share kinds of literature. Slowly, start promoting Affiliate Products in your network. Be Professional, do not scam, do not flood. It takes time to build credit and loyalty among your audiences. HubPage is a popular revenue-sharing site from HuffingtonPost. It allows users to create ‘Hubs’ that are useful to other hubbers. It is similar to blogging, but you are free from such hectic processes as managing a domain and hosting. Creating an account is free, and then choose any of your favorite topic from the available list of categories. Making HubPages are a great option to try your first Affiliate Marketing Business. One advantage is that HubPages itself has Affiliate Programs built on their platform. So, it is easy to take part in those programs such as Amazon, eBay etc. You can create hubs that are almost instant and easily set up your monetization. Hubpages are purely built on User Generated Contents and so your quality. Yes, better you write, better you attract more audiences. Create a free account with HubPages. Choose your favorite topic from the list of categories. Write a blog post on the topic and integrate the affiliate program. Start promoting and monetize your page. Reddit is a powerful tool to use if you know how to use it correctly? Yes, without spamming. This is possible because Reddit thus receives almost a millions of users every single day on their site. So, presenting a product before those audiences can lead to a nice sale every day. OK, the things apart, and now focus on how to start using Reddit for Affiliate Marketing Business. First, you should know the Subreddits, also known as sub-categories where different links are linked together. If you wish to share a picture, you should go /r/Pics and if you are interested in Games, you should go /r/gaming. You should not post links or content in inappropriate places else it will lead to your account banning. Unique content speaks everywhere, Yes, you should post products or information that should be unique and does not violate Reddit community guidelines. All your posts will be approved by the moderators of the associated subreddits. Choose the best selling product from the products category. Improve your Karma Score to more than 200 before starting product promotion. Then start posting your products and earn a commission. You can start an Affiliate Marketing business without a blog, but not possible without the content. Yes, the content can be in any form such as product description, testimonials, reviews etc. It can be in any media such as text, Pictures animations, videos etc. YouTube is for Videos, and you can take this to your advantage because YouTube accounts for nearly 1 Billion visitors a month. Often, if you think writing content is not suitable, then consider creating a YouTube Channel where you can use as Affiliate Marketing Platform. Many people often making a decent income through YouTube Affiliate program. You can create a short video narrating the product or services and publish on your channel. To get success in a very long run, you should be loyal, genuine in promoting your products or services. It works very similarly to other ways and no difference too. Create a YouTube Channel and name it using a competitive keyword. Then, choose a product from your Affiliate Program and start creating a video – review video, testimonial video, sponsored video anything. Once done, publish on your channel and promote it. You can’t get success on your first day because no one was there to see your video. So, first work to create a network of people with the similar mindset and let them subscribe to your channel. Post Interesting videos and share among your network. Slowly it will start making money for you. Use Gmail account to create your YouTube account. Register with any of your favorite Affiliate Program listed here. Start creating videos – review video, testimonial video, sponsored video. Publish on your channel and start creating a network. This is really a simple way to get into Affiliate Marketing Business. All you have to do is find a related product you would like to promote and then find the related blogs and forums. Forums do require an account registration, but most blogs won’t need. The forum has the signature, and so you can use this as an advantage for your Affiliate Product Promotion. Simply add your affiliate URL to the forum signature and save it. When you ask me, Is that OK? I will say NO. Because, you need viewers to see your signatures so be active in the forum, post a new thread, reply to other thread etc. On every post, new or reply, your signature will be placed. The other people in the forum, reading your thread may interest on your signature and buy the product. Blog Commenting also works very similarly to this forum method, all you need is to find related blogs through Google Search and read their blog post. At the end of the article, you can see the comment section, post something valuable and useful information appreciating their work to get your comments easily approved. Register with a forum and create a profile and signature. Participate in all the threads – create new thread or post reply. Add your product to your signature and simply save it. Search Google for Product related review blogs. Write comments appreciating their blog post and get your comment approved. This could be time-consuming but a pure successful method of Affiliate Marketing Business. Write an E-book of 5 – 10pages or more about a topic that you know were expertise in. Don’t forget that, the topic should be trending and most welcoming among the group of the people. Now, add your affiliate products in between the contents or the end of the book as a recommendation for the readers to try. Distribute your Ebook through various Social media channels, PPC campaigns or any methods. Remember, offer your book for free if you are selling someone else’s product or you can fix your cost. You can kick it off yourself by placing your E-book on Amazon for a very small amount so that it can easily reach millions of people around the world. This book of marketing will be suitable for the industry such as – Money making Ebooks, Marketing Ebooks, Trading E-books, Blogging E-books etc. So, choose these kinds of E-books wisely and write an E-book about the industry and finally place the affiliate link at the bottom. You know probably about classified websites where people can post their ads for sale, services or anything and others can view the ad. If they like, they may contact the advertiser. You can use this tech to promote affiliate products. Register a free account with the sites listed below and create a profile. Then, write a review about the product you are interested in and promote here. Just click ‘post an ad’ option and follow the rest guiding the process by the site to post your ads successfully. Not all of your posts will be published because to maintain site quality, your ads will be moderated and if they respect those sites Terms of service your ad will be published or else it will be placed under ‘unpublish’ section. You will be notified via Email about your ad status. Sites recommended to register: OLX, Criaglist, QUikr, Locanto etc. This is the final last method of Affiliate Marketing Strategy and it’s not much recommended. This method involves creating a pay-per-click campaign though Gooogle AdWords, Yahoo Bing, etc. You need to invest money to get your ads live through different online platforms. It’s not advisable because you may face a loss of money that what you earn? But I would recommend you to use your own website or blog, instead of using PPC. First, you can able to create only one ad campaign per advertising product or website at any given time. So, this becomes a tough competition and requires you to invest huge money in the first spot. Don’t know even the first spot will get you the required conversion. Second, you don’t have control over the quality of the advertising page because search engines randomly pick the page and post your offer. If the advertising page has good content and knowledge audience, they can buy your products or services, else you end up paying a much higher advertising fee for nothing. Third, this requires an advanced calculating technique before starting. So, it is advised only to experts and techies and not for newbies. But other methods are free and liberal, you can use any one of the above-suggested methods of Affiliate Product Promotion. Hence, At last in this article, I have shared my own researched data and information about different methods to start Affiliate Marketing Business. Yes, even many different methods are available but when you ask for which method brings the most success was the blogging. Particularly, Niche Blogging bring more success than a general blog. Easy Online Home Jobs was categorized as General Blog because we give ideas, tips, start-up guides, promotional tutorials on Affiliate Marketing Business. But, Niche Blogging was created only for the purpose of that particular product review, testimonials etc. where you can get a higher conversion ratio. In my upcoming article, I will cover about much more information about this marketing business. Does any doubts or queries raise? Feel free to discuss with me through comments or connect with me through social channels. Your Thoughts, Discussion is the fuel for this blog growth and long run. Thanks to you my audiences, and the Internet.